“Good job playing the drums there Calvin,” said Christopher Corn at the very first practice session of his newly found group, ‘Loud Garden’. “Thank you,” said Calvin Carrot. “Let’s try it,” said Christopher. Calvin did what Christopher suggested. He had to admit that it sounded so much better. Mrs. Tomato and Olive Onion both walked up to the microphone and started singing. All of a sudden Cameron Cauliflower ran out onto the stage and started to dance up a storm. Christopher started to dance with him, playing his guitar at the same time. Mrs. Tomato and Olive were laughing so hard that they had to stop singing. Oliver Onion, who was watching, burst out laughing as well. The whole Fresh Veggie family were having a great time together. Christopher started singing again and everyone took their places back onstage and they continued with the song they were practising. Except for that one argument between Mrs. Tomato and Olive, the rest of the practise session went perfectly and the whole Fresh Veggie family had a ton of fun together. You shouldn’t spoil a good time by arguing. Example: Mrs. Tomato and Olive Onion were arguing about their singing parts. Christopher Corn did not want them to ruin the good time they had been having. 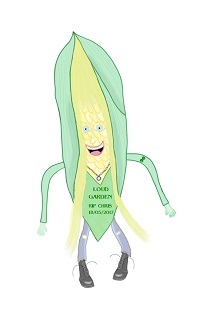 This entry was posted in Christopher Corn Stories, Fresh Veggie Family Stories, Grade 4 Level, Summer Stories, Summer Story Challenge 2017 and tagged argument, Christopher Corn, Christopher Corn is Happy with Loud Garden, dance, Fresh Veggie Family, garden, happy, Loud Garden, smile, song. Bookmark the permalink.